All the crypto wallets work as follows: if you have 100 MNX and need to send 50 MNX elsewhere, the wallet sends the entire amount of 100 MNX and then returns the rest 50 MNX minus transaction fee to the wallet. If you designated the change address, i.e. set it to the address linked to the MinexBank, you will see the rest of coins in your bank balance. 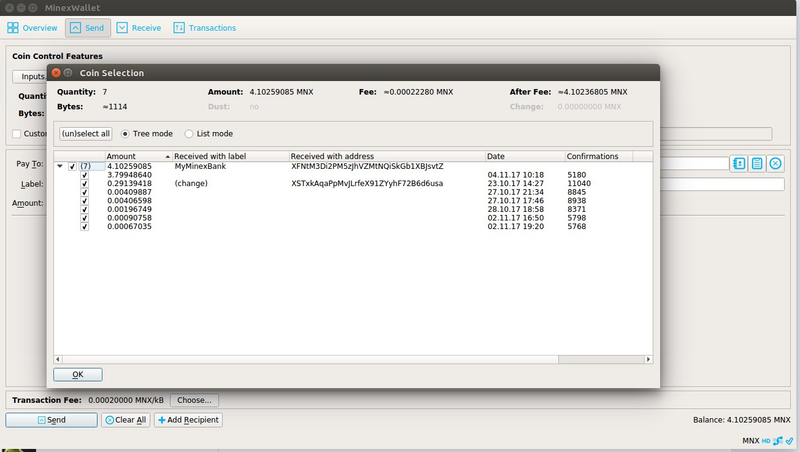 If not, wallet creates random "change" address which can be seen in Inputs in Send menu. To see the Inputs menu you should enable coin control features in your wallet at menu Settings - Options - Wallet - Enable coin control features. Change is of not much importance in other cryptosystems, however, due to our MinexBank and the fact that it only "watches" one specific address you must always take this into consideration to avoid parking cancellation.